After twice tweeting out his gratitude, Trump on Thursday met Xi at the tightly guarded Great Hall of the People, where, surrounded by corporate chief executives, he oversaw the signing of $250 billion in trade deals and continued to praise his authoritarian host. As a candidate, Donald Trump often lashed out at Beijing, blaming the Chinese economy for many US ills. 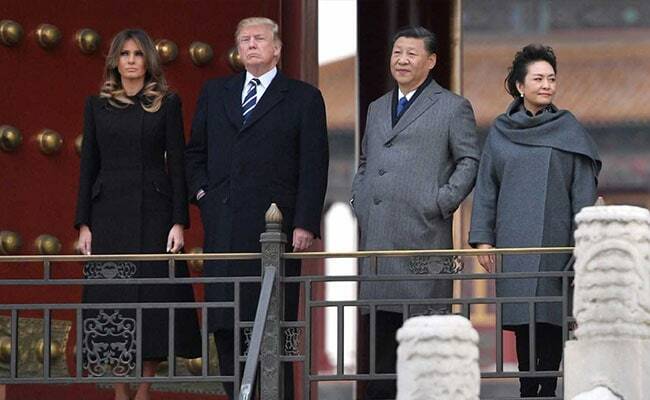 Beijing: When President Donald Trump landed in Beijing on Wednesday, he was whisked through quiet streets to the Forbidden City, where he got a history lesson from President Xi Jinping and caught an opera at the Pavilion of Pleasant Sounds. The two-day trip was orchestrated to project the image of remote and absolute power that Xi enjoys and Trump admires. There were no protests, no questions from the press, no ordinary people - nothing but pleasantries and soothing tones. Trump brought up North Korea but said Xi could solve it. He raised the trade deficit but said it was not China's fault. He said the Chinese people are very proud of Xi. After all the sweet talk, the United States is expecting a lot in return from Beijing - but Xi, in the ascendant, may not budge. That could lead to disappointment in the United States and friction down the road in the relationship. "Talk about embracing the Leninist political system," said Evan Medeiros, who heads the Eurasia Group's coverage of the Asia-Pacific region and was the National Security Council's Asia director in the Obama administration. "In Trump's effort to ingratiate himself with Xi, is he inadvertently ceding American primacy to China?" The United States, Medeiros argued, is the anchor power in Asia because of the rules, institutions and values it represents. "Trump fundamentally calls that into question when he's praising the Chinese political system - and not getting much in exchange." Xi, analysts said, may have calculated that the really tough negotiations with the United States, on a range of issues, still lie ahead - and that China can play a strong hand. Until then, he can sit tight. "My expectation is that not much will come from China," said Max Baucus, until the beginning of this year the U.S. ambassador to China. "And that is going to put Trump in a bit of a box." "The question remains: What is being done about these structural issues?" he said. "We hope to see proactive measures by the Chinese to address the imbalances in the relationship, as pressure is building in the U.S. to take reactive reciprocal actions." But when Trump hosted Xi at the president's Mar-a-Lago estate in Florida, his tone changed. In an apparent effort to secure Xi's help on North Korea, Trump has curtailed his criticism and shifted his focus to areas where he thinks he can win. The focus on signing deals in front of the cameras - as opposed to, say, hammering out solutions to long-standing economic issues - makes some sense, experts said. "We haven't yet had the bandwidth in the U.S. administration or the time to have detailed conversations with the Chinese side on market access and other systemic issues," said Timothy Stratford, managing partner of Covington and Burling's Beijing office and a former assistant U.S. trade representative. "Unless you've had time to discuss these very difficult and complicated issues in some detail, you can't expect the two presidents to announce anything that is concrete and detailed and meaningful," he said. "I fully expect these very tough discussions to begin in the next few months." Chen Dingding, a professor at Guangzhou's Jinan University, said the visit was a starting point - a first offer on the way to the next deal. "What's the alternative? No trade deals? Often you can't get your best deal - you can get your second best, get your third and move from there." Both the Chinese and U.S. sides, of course, are casting Thursday's agreements as first-rate. At a briefing after the meeting, Commerce Minister Zhong Shan said the deals were "a miracle." China's Communist Party-controlled press seems pleased, for now, with Trump's visit, for what he said and didn't say. The Global Times, a newspaper known for its nationalist rhetoric, ran an editorial Thursday headlined: "What do most Chinese people like about Trump?" The piece noted Trump's "frank" character and "pragmatic" approach to U.S.-China ties, mentioning specifically that he does not bring up human rights. One of the main reasons China likes Trump is that Trump likes Xi, the paper argued. "He respects our head of state and has repeatedly praised President Xi Jinping in public." The paper noted in particular that Trump had been quick to call Xi after the recent 19th Party Congress. "This is respect for the Chinese system." The question is what happens if the friendly rhetoric changes - if Trump, for whatever reason, stops being so positive about Xi. With the mood in the United States turning increasingly skeptical about China and the benefits of the bilateral relationship, that has to be a real possibility, experts said. "President Xi and the Chinese leadership will think that they have done an awful lot to give President Trump face: They've done a 'state visit plus,' they've rolled the red carpet out with all the pomp and ceremony, they did all these business deals, and they come away thinking the relationship is on a solid footing," said Paul Haenle, director of the Carnegie-Tsinghua Center in Beijing. "But President Trump may go home to a domestic political environment where people are disappointed he hasn't achieved more progress on trade and economics and North Korea," he said, "and you may see a shift towards a much harder line."